The 5412102855 Fuji FL Series Non Shut-Off Type Straight Pulse Wrench is one of thousands of quality tooling products available from MRO Tools. Please browse Fuji FL Series Non Shut-Off Type Pistol & Straight Model Pulse Wrenches, Sq. 6.35mm/9.5mm/12.7mm for tools similar to the 5412102855 Fuji FL Series Non Shut-Off Type Straight Pulse Wrench. 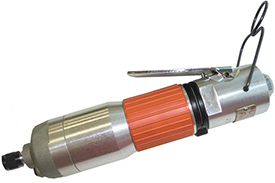 5412102855 Fuji FL Series Non Shut-Off Type Straight Pulse Wrench description summary: Model: FL-5SD-1 Bolt Size: M6-M8 Driver Bit Size: Short (-1) Type: Straight Recommended Torque Range: 11-24N.m/8.1-17.7ft.lb Free Speed: 6,300 min-1 Square Drive Size/Bit Shank Size: Hex 6.35/Hex 1/4'' Overall Length: 210mm/8.27'' Quantity discounts may be available for the 5412102855 Fuji FL Series Non Shut-Off Type Straight Pulse Wrench. Please contact MRO Tools for details.